Bernard Royal has always taken his education step by step. After moving from Savannah, Georgia to Brooklyn, New York, he still needed to finish his high school diploma. Switching school systems meant that he’d have to retake several courses. Instead, he opted to enroll in James Madison High School’s online program. "The curriculum fit my needs," he said. After graduating from James Madison in 2012, Bernard decided to pursue nursing. He enrolled in a local community college, and completed a program to become a licensed practical nurse (LPN). He worked for two years before enrolling in a bridge program that allowed him to become a registered nurse (RN). 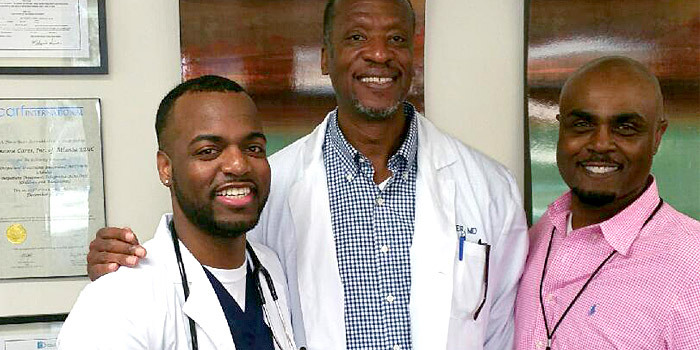 Now, Bernard is taking yet another step in his nursing career—he's earning his RN to BSN degree through the Madison School of Healthcare of Ashworth College while working full time in the Intensive Care Unit at Dekalb Medical in Atlanta, Georgia. When it comes to balancing his busy schedule, Bernard makes time for his studies through consistency and determination. As a nurse, his weekly schedule consists of three days on duty for 12-hour shifts followed by four days off. "When it's time for me to work, I do my three 12s," he said. "I focus on that, get my work done and take care of my patients." He takes a day off to rest, spend time with his dog and pursue other hobbies such as music. Then he focuses the next three days on his schedule to focus on school. "The good thing about Ashworth College's RN to BSN program is it's so flexible." Bernard said he finds little ways to keep himself motivated, like leaving messages for himself on his bathroom mirror. "I write something like 'smile' or 'today's going to be a good day,'" he said. Sometimes, he even writes his name with the credentials he has earned, and hopes to earn, to keep his eye on his career goals. "When I wake up the next morning, that's what I see in the mirror," he said. After completing his BSN, Bernard plans on enrolling in a Master's of Science in Nursing program so he can work toward becoming a nurse practitioner, a Certified Registered Nurse Anesthetist (CRNA), or a nurse educator. And for Bernard, the step-by-step model of stackable credentials is what has made his progress possible so far. "I would like to say to people to not take 'no' for an answer. Just climb the ladder, and you can keep going, the sky is the limit. You are in control of your destiny, and it can be done.